On Wednesday 27th June 2018, the Pupil Chaplains, accompanied by Miss Ahern, visited Our Lady of the Holy Souls church to celebrate 175 years of Mission Together. 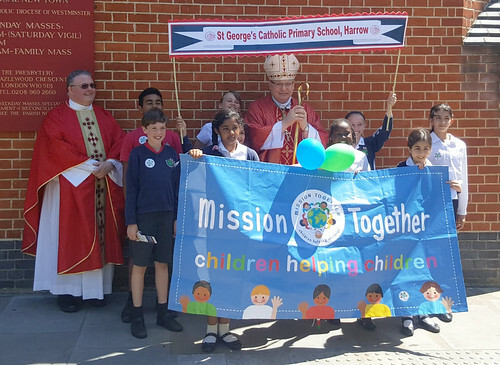 Mission Together is one the charities that we support and the pupils at St George's really enjoy supporting other children. Mission Together is the children's branch of Missio, the Holy Father's official charity for overseas mission. After the service, the Chaplains had their photograph taken with the parish priest at Our Lady of the Holy Souls, Father Philip Baptiste, who is an ex pupil at St George's, and Bishop John Wilson.